Have gone thru many a 1-7 1,7.7 and 1-8 twist .223 barrels over the years and all have shot 52`s, 53`s and 55`s very well. I would add: As long as the bullet can handle the rpm. I’m not really arguing with the article. (just adding a caveat) There are bullets that are good at “X” rpm that will not even make to the target at “X-plus” rpm. Concenticity is not the only factor. A bullet that shoots great at a lower rpm, but that has a thin jacket and soft core, may not handle a higher rpm without disintegration. The supposed point of spinning a bullet is to keep it CLOSE to a standard / predictable trajectory. ALL bullets (and “big stuff”) display some degree of precession; spiralling AROUND the nominal trajectory. The smaller the precession, the smaller the “error” in target. HOWEVER, what happens if the bullet is spun “too fast”? A bullet spun according to the “rules” behaves in an interesting manner as it trundles down-range. Firstly, it exits the muzzle more-or-less aligned with the direction in which the last 5 to 10 calobres of the barrel were pointing at the time. Different load, different bedding etc. 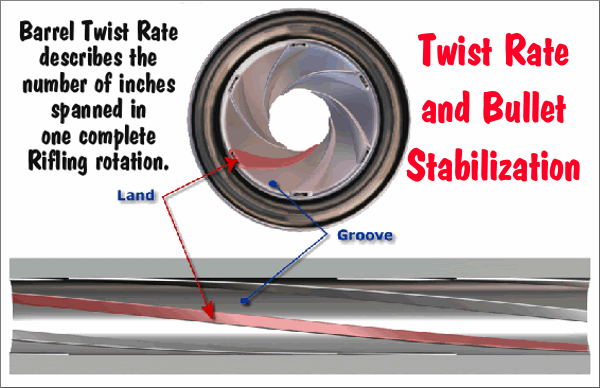 will result in different barrel vibration / whip and thus a different line of departure. ANYHOO….the bullet is “suitably” stabilised to try to remain on this “line of departure”. However, there are other players in the game: Gravity and Drag. Dealing with Drag first: from the instant the bullet leaves the muzzle, it is no longer accelerating, but is pushing hard through the very air we breathe. With a supersonic rifle bullet, the “drag” or “air-resistance” is in the form of “shock cones” that form, primarily at the pointy end. As this resistance has its wicked way with the bullet, these shock-cones start to creep rearwards along the bullet. NOTE; spin rate is essentially unaffected by this resistance. Thus, the ratio of “spin rate” to velocity INCREASES as drag acts. The “tail” of the bullet at these velocities has very little influence at this stage. When the velocity has dropped to the “trans-sonic” region, it gets VERY interesting.The shock cones “fall off” and “base turbulence “and “laminar-flow” resistance take over, always acting to slow the bullet. But, at this juncture, we are not concerned, by sub-sonic bullets. IMPORTANTLY, the rotational velocity is largely unaffected by drag and is still trying to hold the bullet in the same line. Now, we all know that the trajectory is, more or less, a parabola. If the muzzle is elevated to say, ten degrees to achieve another glorious “X” shot, the stabilised bullet will tend to STAY aligned on that ten degrees because that is the entire point of spinning the thing in the first place; if it goes wandering off elsewhere, the whole process is pointless. The catch is that this is (mostly) the “REAL” world, in which we mere mortals are subject to the Laws of Nature in general and Physics in particular. Assume a PERFECTLY made bullet made from perfect materials fired from a perfect barrel with a perfect crown. Said bullet would have its longitudinal centre of mass PERFECTLY aligned with its aerodynamic centre-line, which in turn would be PERFECTLY centred in that PERFECT bore. Good luck with that……. The bullet is fired up the barrel, mostly centred in the bore. As it leaves the crown, it gets interesting. This is the first time the base of the bullet really starts to have an influence. 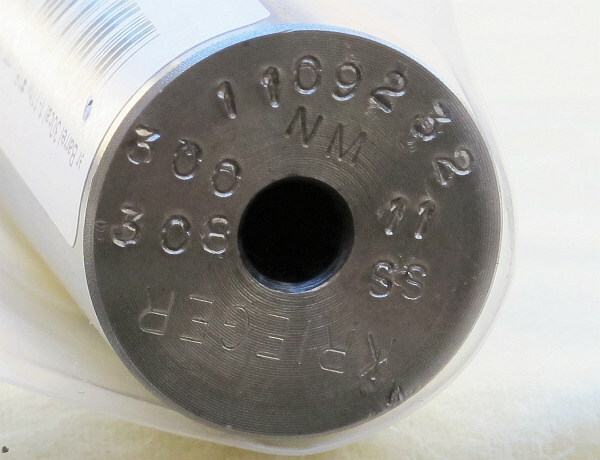 As the base of this “perfect” bullet exits the muzzle, the high-pressure propellant gases “leak” out between the bullet and the crown. If the (in this case, flat) base of the bullet is not PERFECTLY aligned with our “perfect” crown at this critical time, the gas ‘eruption” will be anything but even around the circumference. This may result in very short-lived but quite violent force being unevenly applied to the rear of the bullet, making it “wobble”. Because the bullet is spinning at “ludicrous speed”, this wobble will be “slight” and the projectile will, of course tend to depart on its intended trajectory. BUT, the bullet is now essentially “spiralling” about its own centre of mass. The “gyroscopic” forces are attempting to pull it back into line, whilst the “interesting” supersonic aerodynamic forces are also doing something similar. This “spiralling” is “precession” and is, apart from “operator error”, the primary factor in “groups” from otherwise insanely precise equipment. There’s more. The bullet “wants” to continue on the line of departure from the muzzle, but gravity is dragging it down and drag constantly slows it down. At some point, the bullet will be more-or-less aligned in that original “line of departure”, BUT, its trajectory will be on a somewhat different angle. Something has to give. The forces acting on the bullet will “adjust” its alignment. If this happens in tiny increments and fairly often, the deviation from trajectory should be very small and groups will be “nice”. HOWEVER, if the bullet is OVERSTABLISED, it will try to stay on its original alignment until WAY out of whack (relatively speaking). At some point shortly thereafter, aerodynamics will momentarily triumph and will snap the bullet back to be more-or-less aligned with the trajectory. It is this “more-or-less” part that gives us the odd situation of group size not being “linearly predictable” as range increases. In “extreme” cases, it also partly explains the “funny-shaped” bullet holes at some ranges. Well, that is my understanding of things, anyway. This is a mistake, the “In truth,,,” line should have followed “Now, the biggest misconception is that if a shooter has a .223 with a 1:8″ twist, his rifle won’t stabilize a 55gr bullet or anything lighter.”.